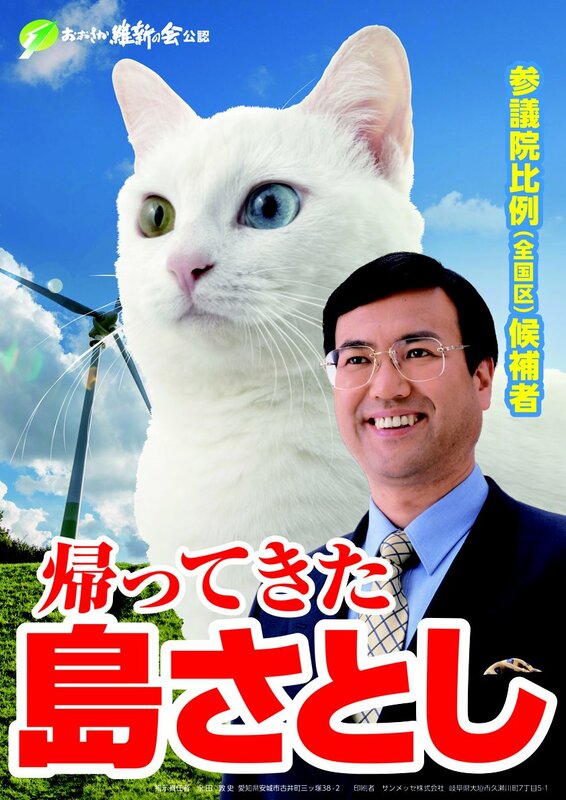 Japanese politician Satoshi Shima is running to represent the Mikawa region in the upcoming Japanese election, and he's campaigning with a cat. While Japanese political posters are really not that different from what we see in North America with a candidate's face and his or her party, Shima is going a step beyond. Along with a caption that reads, “returned home”. While not all of Shima's poster include the cat, that seems to be part of the fun. “If you find one of my white cat posters, you’ll be happy.” So, they’re kinda like four-leaf clovers, but with cats and middle-aged politicians,” he said, according to Kotaku. Lloyd Nolan, actually many white cats with blue eyes are deaf. So, not OK. This cat is heterochromic, the eyes are not the same colour. So probably not deaf. So , being white and having blue eyes is ok , if you’re a cat !